Perfectly comfortable in an urban setting or when exploring the great outdoors, the all-new Renault KADJAR will take you on a journey you’ve never before dared to dream of. 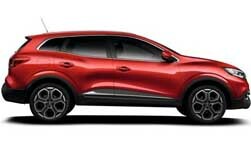 The new Renault KADJAR breaks into new design codes and is disctinictive and powerful. Not just a car, not just a crossover. The Renault KADJAR is an assistant, a guide and a loyal companion. The Renault KADJAR is whatever you want it to be. Test drive at our Renault Bury dealership at a time that is most convenient to you. Take a closer look at the new Renault Kadjar here.